Inventory waste. It is one of the eight forms of Lean waste. It is work in progress or finished goods which are not having value added to them. In software development inventory waste is best represented in the queued activities in between the hand offs from individual to individual. If using a complicated board, you would represent the full flow or value stream for delivering stories. This would normally contain columns such as “Ready for Development” or “Ready for Testing”. A build up of one or two items in these columns isn’t necessarily bad, but when moderate to large queues start to appear it is symptomatic of constraint or flow issue within the team. 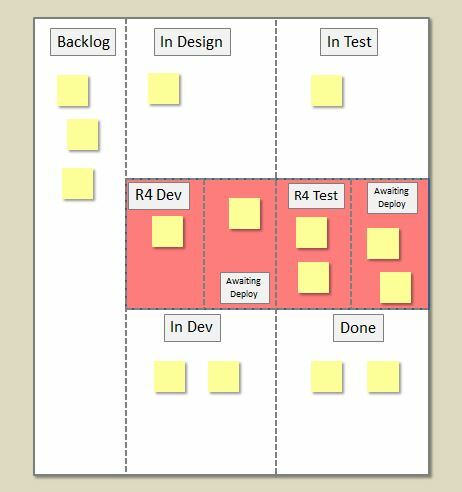 In teams doing Kanban well, they are limiting their work in progress across both the active and the queueing columns (ie “In X” and “Ready for Y” columns). What a Hotspot board does is visually highlight the inventory waste areas of the team’s flow. Rather than structuring flow going across via the headers or columns, it balances the zones of the board so that the inventory waste areas are all in the center part of the board – ie the key focal area of your eye, highlighting the criticality of watching these waste points by backing the zone in red. 2) Visual fixation on only the hotspot results in the “In X” activities having reduced focus. This could result in high WIP of in flight work being ignored which would definitely not be a good thing. To overcome this second issue and to align more closely with one of Kanban’s key pricinples, limit work in progress, I extended the idea of the Hotspot board to become the Twister board (yes like the game with spots). Note: pictures are examples only of flow and work in progress limits. As always, apply this contextually to your work and teams. I don’t currently use a Kanban board, because on a team of 3 devs (including myself) it just hasn’t been necessary for some time. However, when I did, I used a variant of this where the transition zone was at the bottom of the swim lane. Thus work would enter at the top, then move downwards, then go to the top of the next lane. It has a similar effect in allowing for the work-in-transition to be visually obvious, while still preserving the right-to-left flow of the wall. The Twister concept is interesting, especially for helping to limit work-in-progress. I would encourage you to consider extending that to the transition zones, though – accumulation of inventory in transition is also wasteful, as you note at the start. Hey Renee… thanks for sharing your approach. 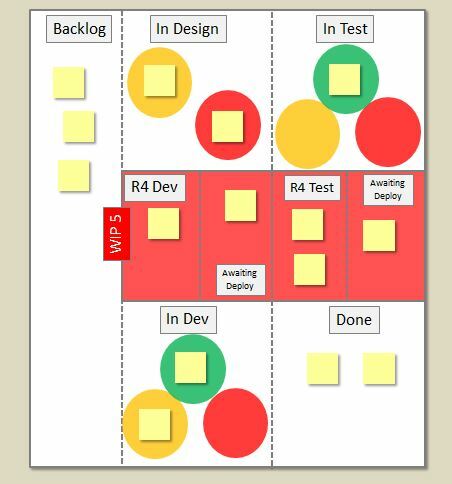 Much like Robert, I used a similar approach an put my WIP lanes at the bottom, so design and dev lanes sat next to each other… but using the circles like targets as a visual cue is a great idea. As another slight change I try to avoid pure red which draws attention very quickly as if it means danger. As you mentioned a little work in the WIP lanes isn’t equivalent to a danger condition – actually if nothing ever gets queued, you can end up with reduced overall throughput due to an accordion effect. On a humorous note, I was looking at your board, imagining it on a wall somewhere, and wondering how I’m ever gonna get my right foot up there to the green circle!